I almost didn't write this post up because it seemed so simple, but it turned into the reason why I did end up writing it. I think we often overlook little updates we can make because we think "oh, I'll do that later" or "it doesn't really matter." And, let's be real, bloggers and blog readers tend to go for big room makeovers and DIY projects. But sometimes those little changes can add up to equal a nice, sunny piece of happiness in the results. 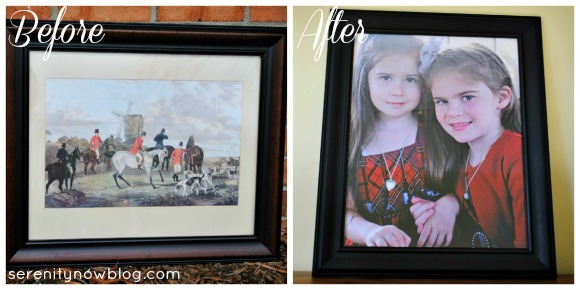 This a "Before" and "After" post of a Picture Frame Makeover. The sad, plain brown frame lived for a year or two in our attic. When T got his fancy TV, we took the print down, but I wasn't willing to part with the frame. I had quite forgotten about until I found myself up there attempting to shove the 42 boxes of Christmas decorations to the back of the area. Honestly, it wasn't really even the frame that was the problem. The print isn't awful, in and of itself. But neither T nor I are particularly interested in fox hunting, and it seemed silly to display something that we don't really care about. So why not update the frame and use it for something we do love? Spotting the frame in the attic reminded me that I had a lovely rolled canvas photo from UPrinting that I had received after doing some work with them a few months back. I hauled the frame downstairs with me, eager for some good spray painting weather. We had a high of 46 the other day, and I decided that I couldn't wait any longer. Armed with my favorite Krylon Dual Spray Paint (it's paint and primer!) in black, I headed outside and spray painted my little heart out. 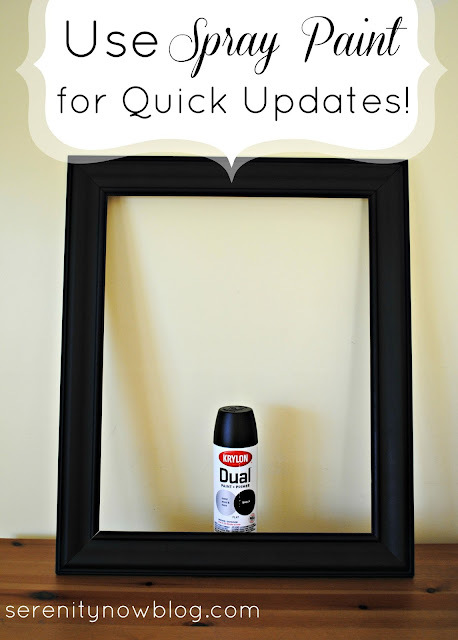 With one coat of the Dual, and 25 minutes later, my frame was dry and ready to be presented in its new look. The power of spray paint, right? 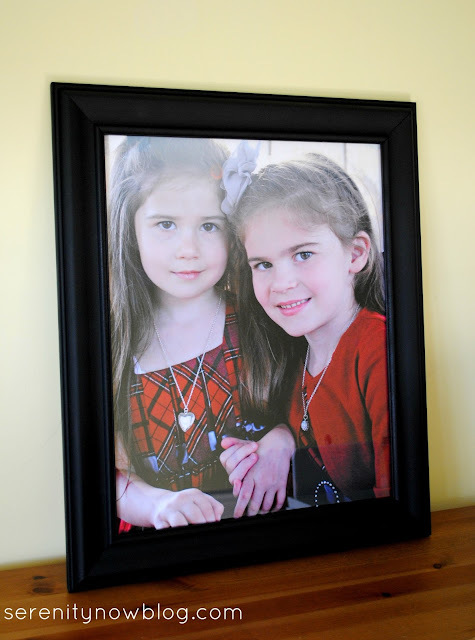 Seeing how great the canvas print of my two pretty girlies looks in the fresh frame had me slap myself on the forehead a bit. Why didn't I do it earlier? It was a great reminder to step up and take on those little projects! Is there a little project in your home that's waiting for some attention? Thank you for the simplicity of this. I often do little things around the house and I think " I wish I could post this on the blog, but it's too easy"
You have made a light bulb go off for me..easy is what we should share...along with fun room makeovers...people like easy..after all that is why I started reading blogs myself. Thanks for the inspiration. Love easy and free! Great picture of the girls. great easy project! i need to remember to work on the little projects too. amazing what a little spraypaint can do! Aren't you smart to shop your attic to find the perfect frame? 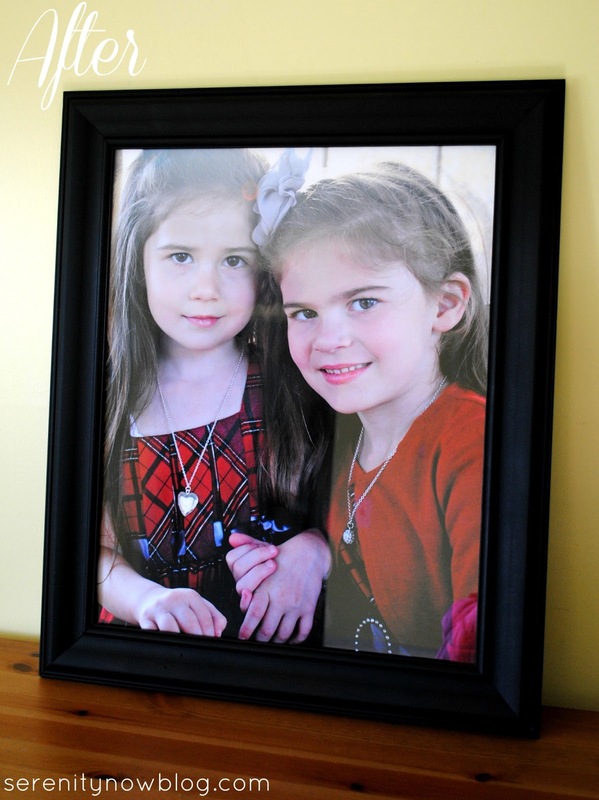 The spray paint gives it the perfect update for the gorgeous picture of your girls. 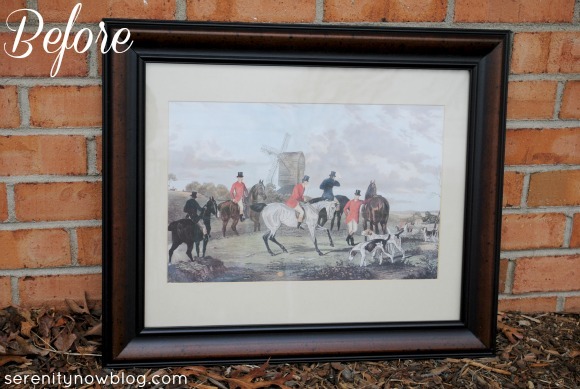 I love hunt scenes and have two antique ones that are favorites. I always always put off these little projects. Thanks for the kick in the pants. One thing I've been putting off is our bedroom curtains. I'd like to cute them in half and make four curtains out of two. It really won't take long. Great work on your frame. Your girls trump fox hunting any day.